Welcome back one and all to the Colors Beauty Pageant~★! Lots of good offers again last round, which I will be handing prizes out for throughout the day. So look forward to that, folks! Time for another round now though, and this time it's going to be just a little bit different to usual. Firstly, as always, we'll take a look at the rules. This round, our theme will be THE MOON. ▪ REQUIRED: Your picture must feature a character and the moon! So like I said, slightly different round than usual! Rather than a theme focused on a character outfit or trait, this time I want your picture to feature the moon. So, essentially, a character at night time (OR IN SPACE?). They can be outside, or they can be near a window - as long as the moon is visible it's fine. I want the actual moon, not the moon as jewellery or on clothing. ▪ Bonus: Your character has a weapon. I don't mind what kind of weapon, just so long as they have one! ▪ Bonus: Your character has a necklace. Easy! You can earn a total of six cards and one crayon per round! Good luck, all of you! ADDITIONAL NOTE: You are allowed to submit one image. You can not post a different image for each theme! This round will close October 26th! Good luck (not luke, as it said last round...), and I hope you enjoy the Pageant~★! 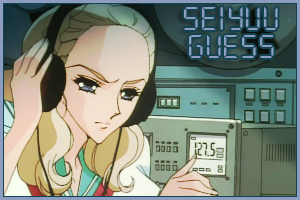 Welcome back to Seiyuu Guess, and sorry for the delay! Last time, Nanami met a very popular young woman! Chiyo Sakura hails from from Gekkan Shoujo Nozaki-kun (or Monthly Girls' Nozaki-Kun, either is acceptable! ), and her seiyuu is Ozawa Ari. Great work, everyone! Prizes shortly! WHAT IS THAT?! What has poor Nanami done to deserve this? Monsters, why so many monsters!! Tell Nanami this character's name, their seiyuu's name, and what show they're from for three random cards. And do it fast, she's freaking out! This round will be closed Tuesday 14th, but the new round will be posting on Friday to get things back on track (and sorry again for the delay). Good luck, all, and thank you for playing Seiyuu Guess! Welcome back one and all to the Colors Beauty Pageant~★! A little over a day late, so I apologise for that, but here we are! With some great work on the last round, as well, so good job y'all! But okay, new round, here we go! Although firstly, as always, we'll take a look at the rules. This round, our theme will be KIMONO/YUKATA. ▪ REQUIRED: Your character has to be wearing a kimono or yukata. Here are the wiki links for those both, but basically just think of traditional Japanese festival wear and you're on the right track (with apologies here for oversimplifying!). This round will close October 12th! Good luke, and I hope you enjoy the Pageant~★! Welcome back to Seiyuu Guess! Last time, Nanami met... a very tiny person! Who knew such a voice could be coming from someone so small! Arietty Clock can be seen in The Borrower Arietty/The Secret World of Arietty, and her seiyuu is Shida Mirai! What large unsightly bows! Nanami just doesn't know what to do with these girls and their wretched fashion choices. Hmph! Tell Nanami the character's name, their seiyuu's name, and what show they're from for three random cards. This round will be closed October 3rd now! Thank you for playing Seiyuu Guess! Welcome back to Seiyuu Guess! Last time, Nanami firmly scolded a certain shoujo heroine... and for some reason the girl thanked her for showing concern and wanted to be friends!! What an idiot! Hrmph! That's right, Nanami met Honda Tohru from Fruits Basket - her seiyuu is Horie Yui. So great work, guys! How absurd! Who would tie their hair up with an ornament shaped like a clothes peg! No, Nanami doesn't see what a cowbell has to do with any of this. And what do you mean the peg is regular sized?! Tell Nanami the character's name, their seiyuu's name, and what film they're from for three random cards. This round will be closed September 26th now! Well done, everyone! Welcome back one and all to the Colors Beauty Pageant~★! Quite a few good responses last round, thank you all so much for playing! I should be getting those prizes out to you in the next day or two (hopefully tomorrow), so look out for that. For now though, here's a brand new round! Although firstly, we'll take a look at the rules. This round, our theme will be APPLES. ▪ REQUIRED: Your character has to be holding/be next to an apple. Yes, really. I looked into this a little, and it's not actually as hard as it sounds so long as you check certain large anime galleries! cough cough cough. Toffee Apples/Candied Apples do count! ▪ Bonus: Your character has blond hair. ▪ Bonus: Your character is outside! This round will close September 28th! Good luke, and I hope you enjoy the Pageant~★! Welcome back to Seiyuu Guess! Last time, Nanami met the extremely pretty Takayami Yanagi from Glasslip! Her seiyuu is Saori Hayami! Is it appropriate to watch a show just because a lady is pretty? Ahem. Let's move on. There's three of them! Apparently they're quite inseparable, and those two in the background don't like Nanami asking questions about their friend. How rude! How suspicious! So Nanami needs you to find out the answer instead. Don't worry, though - Nanami only wants to know about the girl in the foreground. The one with the pigtails in light blue. So don't worry about the other ones, okay! Tell Nanami the character's name, their seiyuu's name, and what series they're from for three random cards. This round will be closed September 19th! now! Thank you for playing Seiyuu Guess! Another cheerful sort, and actually smiling this time! Her colour scheme reminds me of Kiki's Delivery Service a little, hahaha. But this is about Nanami, not me, so! Tell Nanami the character's name, their seiyuu's name, and what series they're from for three random cards. This round will be closed September 12th! now! This round is now over! Welcome back one and all to the Colors Beauty Pageant~★! It's been a while since the last round, so let's try to ease back into this with something that's hopefully not too difficult! Let's go! This round, our theme will be NEKOMIMI. ▪ REQUIRED: Your character has cat ears and/or a cat tail! They can be male or female. Also, it can be cat ears attached to a headband or something similar - the character doesn't necessarily have to be a literal cat-person! ▪ Bonus: Your character is wearing something purple. ▪ Bonus: At least one extra nekomimi character is visible. Let's all wear our ears together, guys! This round will close September 14th now! Thank you all, and I hope you enjoyed the Pageant~★! Wow, who remembers Seiyuu Guess! That game of bygone days, where you identify a seiyuu based on an image of their character? Well, here we are, back in action and aiming to be posting on Fridays henceforth. For a bonus bit of news, Beauty Pageant should also be returning on Sunday too! Hooray, hooray!!! A lifetime ago someone was the answer to the last round. ... FINE, I'LL GO CHECK. Last time, Nanami met Nice from Hamatora! His seiyuu is Ryota Osaka, and I accepted all variations on the spelling of his surname, hahaha. So well done everybody who played! What a cute and friendly face! Even if he does seem to be struggling with the summer heat, poor thing. This fellow seems to have a bright and bubbly personality, as well as a great memory for names, but something about him seems a little unsettling. Hmm... Tell Nanami the character's name, their seiyuu's name, and what series they're from for three random cards. This round will be closed September 5th! now! Thanks for playing Seiyuu Guess!! So here we are! The last fan event before the Colors League officially kicks off (in four more days!). The good news is, this event is nice and simple. In fact, all you have to do is pick your option, sit back, and wait for your prize! Below the cut you will find thirty-two tickets, each represented by a different anime or video game. What do these options represent? Well, each one represents one of the thirty-two different countries who played in Brazil at this years FIFA World Cup - the inspiration for our 2014 Colors League, of course! Of these thirty-two countries, some obviously went further in the competition than others. By picking one of these options, you will receive some kind of card-based prize, but just how great that prize is depends on which country is assigned to the ticket you select! ♥ Pick one of the thirty-two options below. Each options represents a FIFA World Cup participant, but you won't know which is which in advance! ♥ After a week has passed, you will receive a prize based on how well your randomly chosen country did! Remember, the options have been completely randomised. Pick your favourite fandom if you like, or pick something you've never heard of before, or something no one else seems to be choosing. Whatever you prefer! But the countries and fandoms were matched completely randomly, there is no rhyme or reason to it. So don't think too much! It's absolutely fine to select the same option as other people, of course! Now, on to the options! When commenting with your option, feel free to list only the number. If you want to name the fandom or whatever else that's fine too, just make sure you include the number at least! It'll be easier for me that way! EDIT NOTE: I made a slight mistake here, so the prizes have been altered slightly. But don't worry, you're either getting the same prize as first listed or a better one, i.e. two random cards has been changed to four and so forth. NOTHING BAD, JUST DIFFERENT. ♥ Everyone will receive at least four random cards, regardless of whether their team progressed beyond the group stages. So no matter what happens, you'll get at least four random cards. ♥ If your team progressed beyond group stages but was eliminated before the quarter-finals, you will receive six random cards. ♥ If your team was eliminated in the quarter-finals, you will receive eight random cards. ♥ If your team came fourth, you will receive ten random cards. ♥ If your team came third, you will receive twelve random cards. ♥ If your team came second, you will receive fourteen random cards. ♥ And finally, if you team came first, you will receive eighteen cards! Woohoo! This event will be open for commenting until August 3rd, so get to it, people! And above all, have fun with Colors League 2014!! 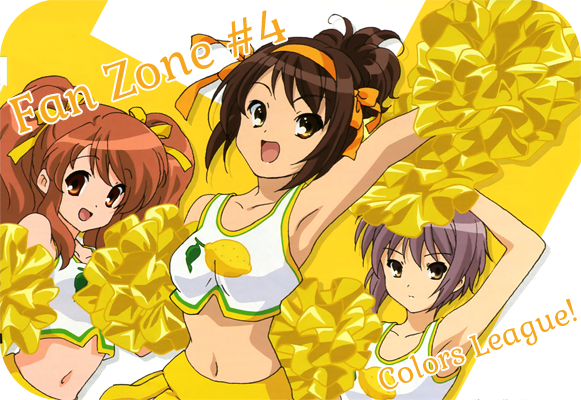 Colors League Fan Zone - Event #2! So here we are for the second Fan Zone event! With this years Colors League growing ever closer, these fan events are here to remind you that there's still time to sign up! And for those of you unable to participate, it's a place for you to have some casual fun and grab some extra prizes on the side! Of course, league participants are just as welcome to play. So everyone come and get yourself some cards with this little game! 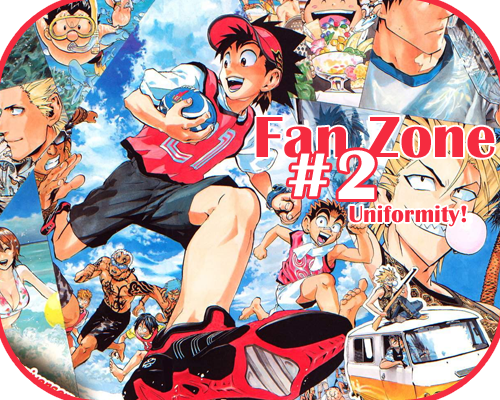 Beneath the cut you will find six sportsmen from various different anime. Your task is only to identify what sport each character does. That's it! I don't need their name, I don't need their series, I only need to know what sport they participate in. Of course, if you want to tell me their name and how much you love them then be my guest! But it won't get you any extra points, hahaha. Remember, two cards for every sport you identify, a random crayon if you manage to get all six correct! This game will end July 15th. Best of luck, everyone! Welcome back to Seiyuu Guess! Last week we met a no-nonsense fighter with a peculiar weapon! Maka Albarn hails from Soul Eater, and her seiyuu is Omigawa Chiaki. Great work everyone, we had a lot of players in the last round so I guess she must be a popular character! A young man this time! Those a nice headphones he's got there, though let's hope he hasn't been getting into fights with all those little plasters on his poor face! Tell Nanami the character's name, their seiyuu's name, and what series they're from for three random cards. This round will be closed June 30th now! Thanks for playing, all!! Welcome back to Seiyuu Guess, after a bit of an unintended hiatus! Sorry about that, chaps! Some weeks back now, Nanami encountereda young woman who uses a lot of different pseudonyms! But I believe most of you would know her as Juliet Capulet, of Romeo x Juliet. Her seiyuu is Mizusawa Fumie! Great work guys, and thank you ever always for your patience! You are superstars. Another lady this time, and a fiercely determined one at that. Nanami knows a little bit about duelling, as it happens, but something tells her that is no ordinary weapon. How strange! But we're only worried about the girl. Tell Nanami the character's name, their seiyuu's name, and what series they're from for three random cards. Remember, I only require the original japanese voice! And if this character just happens to have been featured in any drama CDs (cough cough), don't worry about that. Just their anime seiyuu is fine! This round will be closed June 22nd is now over! Thanks for playing, all! "Wait now, hold on! THAT'S NOT AN EAST ASIAN SOURCE, GARGANT. YOU'VE BETRAYED ME." Don't be mad, Colors friends! 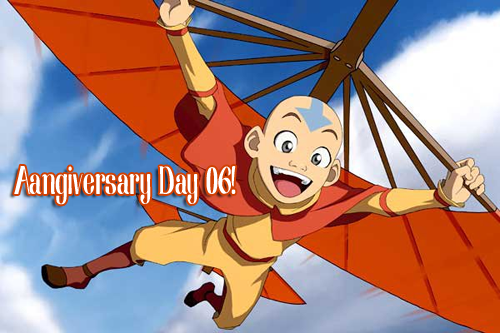 Today's anniversary post is a discussion post, and the topic should elucidate my banner choice for you all! This is for your western animation, for your live action, for your book characters who don't even have images, for your favourite Pony or even just that one side character who will never have enough images no matter what you do. Tell me about the decks you'd love to collect if only Colors were different! Or maybe every single character you could ever want is already in Colors, you lucky ridiculous person. If so, tell us about that instead! Wow, it's the first piece of the puzzle image! Comment to this discussion post and you will receive fourstival06! You can also choose a character choice card that is either brown or grey. Go ahead and take your choice card after you've commented to this post, no need to wait for a reply! This discussion will end at 12 (noon) GMT on July 1st. Welcome back to Seiyuu Guess! Last week was a world of indecency! That man may have tried to introduce himself as Jack Simon, but you should really know him as November 11, from Darker than Black. His seiyuu is Kazuhiko Inoue, and he promises to keep himself clothed in company from here on. What a vivacious young woman! And with some actual propriety, thank goodness. Tell Nanami the character's name, their seiyuu's name, and what series they're from for three random cards. Remember, I only require the original japanese voice! This round will be closed May 30th! Good luck, and thank you for playing Seiyuu Guess! 1. Cheria Barnes from Tales of Graces, voiced by Shiho Kawaragi. 3. Nina Einstein from Code Geass, as voiced by Saeko Chiba. 4. Neviril from Simoun, as voiced by Rieko Takahashi. Neviril in particular seemed to catch people out, so you all should go and watch Simoun! IT IS THE ONLY WAY. But anyway, let's get back on track. SHRIEK!!! How can this be happening again?! Can these people really not be trusted to at least dress themselves?! Honestly! Someone identify this man so we can get him removed, immediately!! Tell Nanami the character's name, their seiyuu's name, and what series they're from for three random cards. Remember, I only require the original japanese voice! This round will be closed May 23rd! Good luck, and thank you for playing Seiyuu Guess! Welcome back to Seiyuu Guess, and I will explain the banner change momentarily!! But first, business. Last week Nanami met the plucky one from Mobile Suit Gundam Wing, who we all know as Duo Maxwell! His seiyuu is Toshihiko Seki, and loads of you got it right, so great work everyone! Now for a little bit of self-indulgence, but don't worry! It'll benefit you all as well! 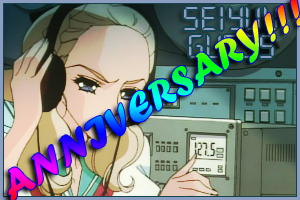 This week of Seiyuu Guess will mark one year since I started posting this game (as well as Beauty Pageant), and so we're going to have a bonus ONE YEAR ANNIVERSARY FOR GARGANT POSTING GAMES round to celebrate that! This week Nanami is being subjected to a whole chorus of voices, which may or may not coincidentally be favourite characters of mine. See if you can identify them! As usual, we're looking for each character's name, what game/series they come from, and of course their seiyuu's name! Don't forget that we only need the original japanese voices! For each character you can earn three cards, making a maximum of twelve cards. If you get them all correct, you'll get a crayon as well! So the maximum prizes for this round is twelve cards + one crayon. Good luck! Thank you everyone for being wonderful. When I took over this game, way back on LJ, I'd receive about five replies per round. Just look at how much things have changed! I see this huge friendly open playerbase and just couldn't be happier to have a moderator role here at Colors - you all very genuinely brighten my days, so thank you so very much! And I hope you enjoy this round! This round will be closed 15th May! Good luck, and thank you, now and always, for playing Seiyuu Guess!! Welcome back to Seiyuu Guess! Last week, proved to be a tricky round! I do apologise for that, I didn't mean for the information to be quite so difficult to verify. But a bunch of you did solve it, so great job! The voice Nanami heard belonged to Xelha from Baten Kaitos: Eternal Wings and the Lost Ocean (though just Baten Kaitos will be fine!). Her seiyuu is Chiaki Takashi/Takahashi (I'll take either!). Is it too soon to call this oldschool? Retro? THE DISTANT PAST? How can this be, so soon! I'm thinking this face will be more familiar to a lot of you, to make up for the struggle of last time. So get searching, all of you! This round will be closed 8th May! right now! Thank you for playing Seiyuu Guess! Welcome to the Colors Beauty Pageant~★! A few people commented on the last round being a little tricky, so let's see if this round ends up working out a little bit easier! Then again, you guys never let me down. So a little belated as ever, but let's get going with the Beauty Pageant! Although firstly, let's take a look at the rules. This round, our theme will be WRITING. ▪ REQUIRED: Your character is writing! In this case I mean the physical act of writing something by hand, not typing at a computer or writing a text. So long as it isn't digital it almost definitely counts! ▪ Bonus: Your character is writing on something that isn't paper. See what you can find! ▪ Bonus: Your character is wearing glasses! ADDITIONAL NOTE: You are allowed to submit one image to represent the three themes. If your image needs further clarification for whatever reason feel free to post on the Questions thread, but only one image in your submission comment please! This round will close May 11th! Good luke, and I hope you enjoy the Pageant~★!